Since we initially published this post Yoast SEO published an update (version 7.0) that caused some major issues for some websites. A setting was automatically changed that created hundreds, and sometimes thousands, of new URLs that were then indexed by Google. They have since released a patch and offered an apology/solution for the problem. Please note that not all websites using this plugin were affected only those that installed version 7.0 prior to the patch. If you think your site was affected please contact us and we can help diagnose the issue for you. Yoast is a plugin for your WordPress website that focuses on making on-page Search Engine Optimization (SEO) as simple as possible. They offer a Free version with limited basic features such as snippet optimization and webpage copy review and a Premium version that allows you to mass edit your meta data, create redirects, and link your Google and Bing properties. We use Yoast on virtually every WordPress website we build. It is a very powerful tool that makes the basics of On-Site optimization easy for anyone to follow. How Does The Yoast Plugin Work? The Yoast SEO plugin is a powerful and comprehensive SEO tool that allows its users to quickly and easily make changes to their site for the benefit of SEO. I will walk you through some of the different sections of the plugin below and explain how each section can be used for optimizing your website. Note: Some of the features discussed below are from the Premium version of Yoast. This is a yearly subscription program that gives you access to additional features for optimizing your website. The Dashboard section is the “Home page” for the Yoast plugin. Here you can edit settings, features, company information, link your Google Search Console & Bing Webmasters account. The Titles & Metas section is where you manage, you guessed it, the title and meta information for your website. You can select what the default separator will be on your website ( – | ~ < > etc.). Typically I prefer the | character, but you can choose your preference. Aside from the separators this is actually a very powerful section. The Post Types & Taxonomies sub-menu items are essential to the SEO success of any website. Post Types refers to the various types of posts on your website including blog posts, pages, or any piece of content. Since WordPress evolved from a blog platform into a full blown website Content Management System (CMS) the post name stuck around. Taxonomies refer to the grouping of these Post Types. For example, a specific category would be a Post Type but all categories would be a Taxonomy. Therefore if we had a category called SEO which included many different blog posts pertaining to SEO, the blog posts would be Posts, the category would be a Post Type, and all the categories as a whole would be a Taxonomy. These Menu options allow you to create customized Meta Titles and Meta Descriptions for every type of post/page on your website. For example, if you edit the Categories Taxonomies section it will update the default meta data for all Category pages that you currently have, as well as any new ones you add in the future. This is a great way to get a consistent Title formula and Description across many pages quickly and easily. Note: if you have already customized an individual page/categories Meta Title & Description updating at this level will not override your settings. The Social section of Yoast allows you to add structured data to your site identifying your Facebook, Twitter, Instagram and other Social Media channels for search engines. In addition, it allows you to upload a default image that will be shared whenever someone shares your URL’s if there is no defined image on the page. We recommend uploading your logo in a format that is suitable with the specific social network. See our post on Social Media Sizes for reference. Note: our Social Media sizing post was last updated in 2017 and there may be slight variations in sizing since then, however, it should remain fairly accurate at least as a reference. The XML Sitemaps section of the Yoast plugin allows you to create and manage your sitemap. A sitemap is a file that provides information on every page of your website, your website structure, and the hierarchy of pages based on importance. In the Sitemap section of Yoast you are able to add/subtract sections of the sitemap including Categories, Products, Posts, Tags, and any other Post Type or Taxonomy you may have on your site. The Advanced section contains settings for turning on/off your websites breadcrumbs and adjusting your URLs. Breadcrumbs are the navigational links that display at the top of your website. Note: Breadcrumbs cannot be added through this section only turned on/off if they already exist. Adding breadcrumbs to your website requires changes to your websites theme and will need to be completed by a developer. The URL options in the Advanced section of Yoast allow you to add/keep URL modifiers such as /blog/ or /category/ into your URLs. This is useful for creating a clear URL structure, however, this needs to be done carefully. If you are implementing these URL changes after your site is already launched you will need to individually redirect the old pages to the new URL including the /category/ modifier. In general, we suggest you consult your web developer/SEO company before making changes to your URLs. The Tools tab in Yoast allows you to upload bulk editor files and import/export your settings to other websites you may own. The bulk editor allows you to upload a file that will update the Meta information for each page without having to go into the pages individually. The Search Console section of Yoast provides users an area to verify their Google Search Console property without having to access the code of the website. Traditionally, verifying a Search Console account required a file to be uploaded to the websites server. Now you can simply plugin your authorization code and you are set. The Premium section of Yoast allows you to add your Premium license to activate Yoast Premium on your site, as well as highlighting other upgrade features that Yoast offers. The upgrades include Video SEO, News SEO, and Local SEO. Each focuses on optimizing your site content based on the audience and content type. The Redirects section of Yoast is one section that I personally use most frequently. Redirects allow you to point an old URL to a new URL. For example, if your old contact page was https://yoursite.com/contact-us/ and you need to change it to https://yoursite.com/contact/, you can tell Browsers and Search Engines that this page (https://yoursite.com/contact-us/) no longer exists and to instead redirect all users to this page (https://yoursite.com/contact/). Whenever you change the URL of a page, the URL structure of a certain set of pages, or even remove popular sections of your website; it is recommended to redirect your old URLs to either the new page or the closest comparable page. Over time, links may accumulate from other websites, users may Bookmark certain pages of your website, or internal links that you have forgotten about can point to the page. By not redirecting these links it will cause that link to break, creating a poor user experience and indirectly affecting your SEO. Note: Make sure you are very careful when adding redirects to a site. Creating redirect chains or loops can cause significant problems for your website. A redirect chain happens when one page redirects to a page that is then redirected to another page. As long as there are two or more redirects it is considered a chain and should be avoided. A redirect loop happens when you redirect a page to another page that is then redirected to the original page – causing a loop. We recommend consulting with your web developer/SEO company before adding any redirects or ask them to add them for you. 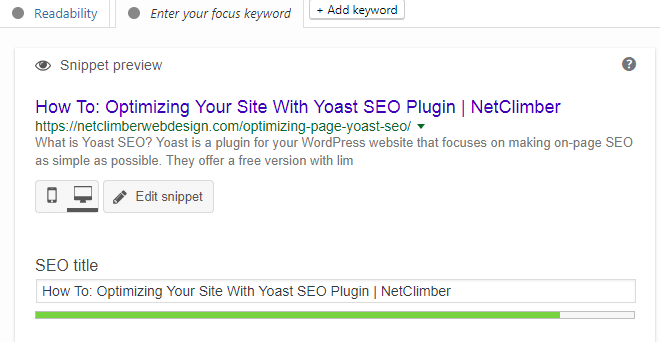 As one of the most common tools used by the average WordPress user, Yoast’s Snippet Optimization tool allows a user to quickly and easily change the Meta Title, Meta Description, and Focus Keyword of the page. This tool will also provide you with a score for your optimization by analyzing information such as keyword placement, keyword density, page structure, and readability. The readability score will provide you with details on how to make your page more user friendly, flow better, improve grammar, and improve the quality of your copy. This is an extremely useful tool for improving the overall quality of your page. First off, what is a Snippet? A Snippet is the combination of a Meta Title, Website URL, and Meta Description displayed in Search Engine Results Page (SERP). Think of it like this: The Meta Title is the big blue text in the SERP. The Website URL is the small green text in the SERP, and the Meta Description is the grey text in the SERP. See below for reference. Let’s work through the optimization process step by step. I will use this very blog post as an example. Here is an example of what the default Snippet looks like for a page. 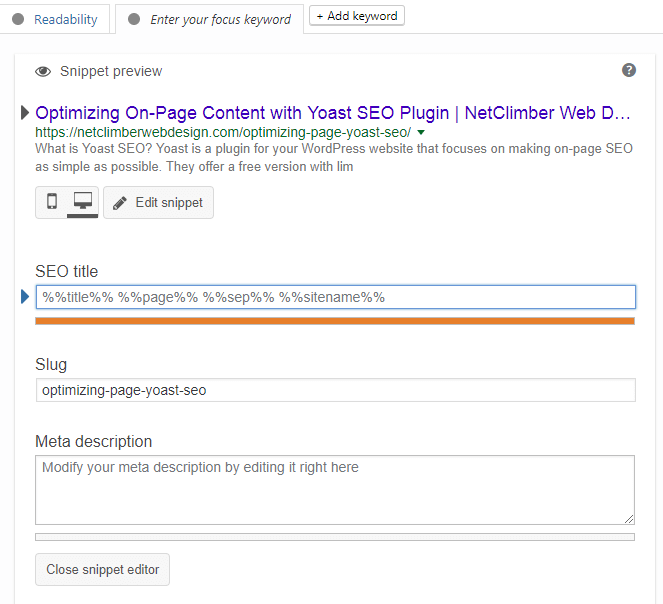 Notice that Yoast is automatically pulling in the Page Title and website title for the Meta Title and the first bit of copy on the page to populate the Meta Description. Although the length of the Title varies from search to search you should aim to be between 60-80 characters in your Meta Title. There is a bar under the SEO title section of the Snippet editor that will turn green when you are within the recommended length. Use some keywords or search phrase that you think people who are likely to be looking for this page would use. Try and mention your location or business name (only if applicable). If your page is locally focused, add your location. If not, add your business name. Don’t keyword stuff. Add only 1 or 2 keywords. If they make sense and fit within the title element. Don’t force keywords into your title, this may hurt more than it helps. Treat your Meta Title as your headline. The title element is your Headline to capture their attention and your Meta Description is your sales copy to win the click. This title gives them information about what the page is about (Yoast SEO) as well as the format it will be presented in (instructional or how-to). In addition, it includes the company name at the end and not a location. This content can be used by anyone looking to use the Yoast SEO plugin not just people located in Delta, BC, therefore it shouldn’t include the location. This title doesn’t really give me much information. Yes I know it’s about SEO and maybe has something to do with Yoast but it’s unclear. In addition the keyword SEO is used 3 times in short succession making it look spammy. As mentioned above this content is for everyone and not just people in Delta, therefore there is no reason for Delta to be in the title. There is not much to optimize when it comes to the websites URL (or slug). Essentially you want the URL to be clear and contain some information you are going to be discussing on the page. You want to include a keyword and exclude filler or transitional words like we use in sentences. This URL includes the keywords, Yoast SEO, and gives a little information about what the page is all about – optimizing your page with Yoast SEO. Notice it doesn’t include the words “your, with, or and.” It is recommended to always keep these out of your URLs. WordPress will do that automatically for you when you set your page title. So when picking your page title think wisely about what you want your URL to look like. Once the page is published we do not recommend changing the URL unless absolutely necessary. This URL gives the same information as the good example above except for a few key differences. First it uses extra words that are unnecessary in the URL such as “your, with, plugin”. Second, it doesn’t use dashes to seperate words. This makes it confusing to read and not user friendly. You want to make it as easy as possible for the user to see and understand your URL. The Meta Description should be seen as your sales copy. Write a convincing argument, generate intrigue, give them the information they need in order to win the click. Your description should give information about the page, contain some keywords (naturally) and prompt users to click on your link. Most people only skim the Meta Description so do not make it too complicated or dense. Keep your Meta Description to short easy to digest sentences and words allowing for quick scanning of the information. The Snippet tool will give you an estimation for the length of your Meta Description, however, it is around 155 characters – when you are in the “sweet spot” the bar underneath will turn green. Note: Google has a frustrating habit of writing their own Meta Description. They pull information off the page they think is relevant to the searchers intent in order to try and win the click for you. Google does not always do this, but just note that it is a possibility. 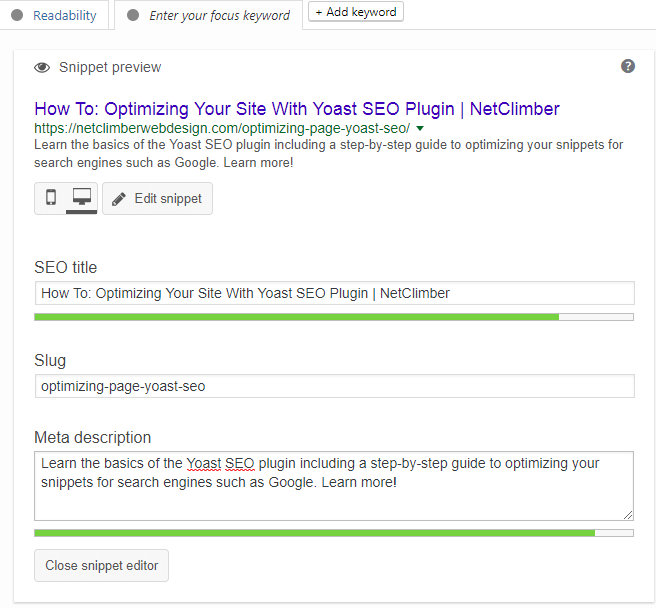 Learn the basics of the Yoast SEO plugin including a step-by-step guide to optimizing your snippets for search engines such as Google. Learn more! This description is simple, easy to read, gives the reader information they are looking for and is the perfect character length. It also contains a Call to Action. Asking the user to learn more is a way to prompt them to click if their interest is piqued. Yoast SEO walkthrough. Optimize your site with Yoast SEO plugin. Tips and tricks for your sites SEO with NetClimber Web Design. This description is awkward, feels disjointed, contains too many keywords, and doesn’t really tell the user what to expect when they click the link. You want to make it very straightforward and sound natural. If you have to force the keywords into the description, it’s not good. Let it flow naturally and give pertinent information. Notice at the top where it says Readability and Enter your focus keyword? We are going to talk about those next! The Focus Keyword is how Yoast judges your content. This is your way of saying to the system this is what I want this page to rank for, or this is what this page is about. Although there are a couple different ways to go about entering this keyword, my advice is to put the most straightforward in place. Choose the keyword that is best represented by the page. For this page I have chosen “Yoast SEO plugin”. The system then scans the page looking for this keyword in certain places (URL, Headings, Page Title, Copy, Meta Description, Etc.) and gives you a rating. This rating comes in the form of either a Red Light, Orange Light, or Green Light. Red means this page doesn’t relate very well to the specified keyword. Orange means the page relates pretty well to the specified keyword. Green means the page relates strongly to the keyword. In addition, the rating system also gives you some recommendations to improve your page’s relevancy to the specified keyword. These include things such as adding the keyword into a Heading on the page, updating the URL, adding/removing the number of times the word is used on the page (yes, you can have the word on the page too many times. Around 2.5% density is preferred), and more optimizations. Note: It may be tempting to always go for green but this is not always possible. Some content may not be able to get a green light and this is OK. As long as you are following best practices you should be fine. The green light is simply a visual guide to let you know if you are on the right track. The Readability Analysis functions in a similar way as the Focus Keyword. It assigns a colour to reflect whether or not your copy is easy to read (green), fairly easy to read (orange), or difficult to read (red). The readability function focuses on the layout of your page, sentence structure, grammar, level of vocabulary, and the formatting. It checks whether you have headings at appropriate intervals, if you are using lists, what reading level the language is, if you are using appropriate transition words, and more. By addressing the individual recommendations you can drastically affect the amount of time people spend on your page. Have questions about the Yoast SEO plugin? We can help. Give us a call at (604) 628-2403 or Contact Us directly.